People get stuck all the time. Don't they? Don't you? Life, as a result of circumstances, sometimes surprises you with a reality that can make you freeze. And then you're stuck. You become mentally blocked to the options you have, feel frustrated, experience pain, and from here, the path to a series of wrong decisions is quite natural. Here's where all get wrong. Is this something you can allow yourself? Do you have enough available resources to play with your life and allow the temporary feeling of being stuck become the frame of mind that controls your life? I don't think so. And yet, it happens all the time. Just look around you. 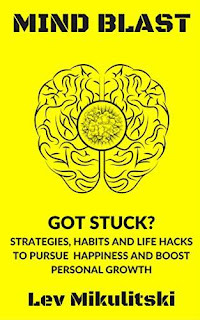 MIND BLAST is your getaway from being stuck!